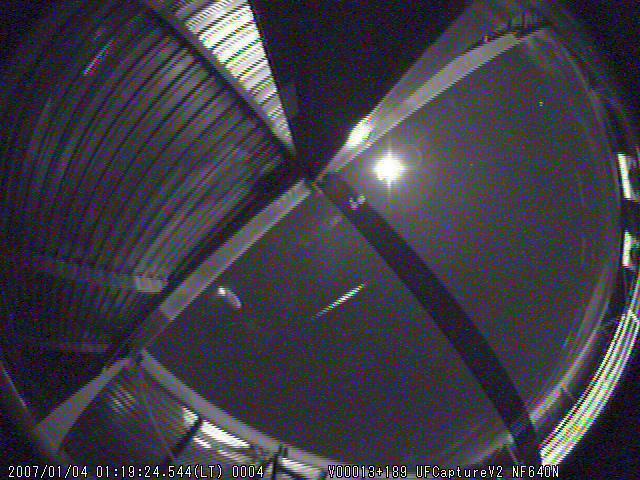 1) I have a Supercircuits PC164 CCD camera and find that the image observed using UFOCapture has alight horizontal lines - the image is not clear. I have tried changing the input resolution, as I am pretty sure this si the issue, as the lines diminish at some resolutions and are worse at others. Has anyone found the correct matching input resolution for this common camera? 2) I have had no luck getting the ftp function to work. 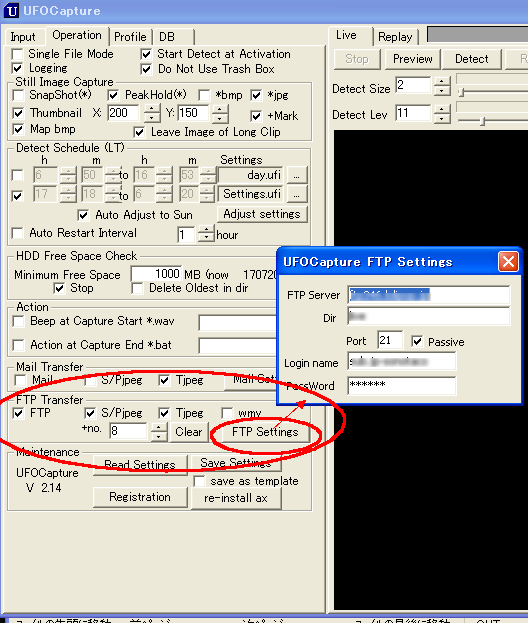 I have a functioning ftp account but the software will not send the files to the ftp account. I am told by some of the technical assistance people at my workplace that ther Port may need to be set to Port 25. Does anyone know how to change the ftp port, or what the internal settings are? 3) I would like to detect meteors during the day and night. If anyone has tried-and-tested input settings to exclude such irritants as rain, snow etc I'd really appreciate hearing what settings you have found that work. Resolution is generally decided by video format(NTSC or PAL) and input device(analog or IEEE1394). The best resolution is as follows. I think there may be some reason other then resolution. Could you show us the "alight horizontal lines" ? UFOCaptureV2 uses port 20 and 21. It is the default of Internet. You can set port number in the FTP setting dialog. But I think, port 25 is usually for Email and should not be used for ftp. I am afraid that there are some fire walls or security blocks on your system/network that blocks port 20 or 21. Though, there was a bug in ftp process of UFOCaptureV2 V2.13, this bug was fixed in V2.14. Well, It is very difficult. Once I have tried all day and night detecting. At that time, I use two settings. One is for night, and the other is for day. I made two schedules in Operation sheet, and switching them by Schedule settings. Though it worked fine, but rain or snow cannot be eliminated anyway. Thanks for the swift reply. Very helpful. I can't believe I couldnt see the Port number setting in the FTP section!- I must have looked at that window several times! I'll upload a screen capture Thursday, thanks for your feedback. I've never experienced the excellent degree of feedback/follow through support that appears to be the case with UFOCapture. Not sure what you mean about the lines, can you send a screenshot? Sometimes lines can appear due to the capture device being used. For instance, the first capture device I used, a KWorld EZ DVD maker, showed vertical 'lines' in the image. They were not really lines but compression artifacts, the video image seemed to be getting compressed in vertical 'strips' . It was not intrusive however, and did not interefere with detections. Robert. Please find attached a screenshot taken at 640 x 480, 29.97 fps on the input screen. 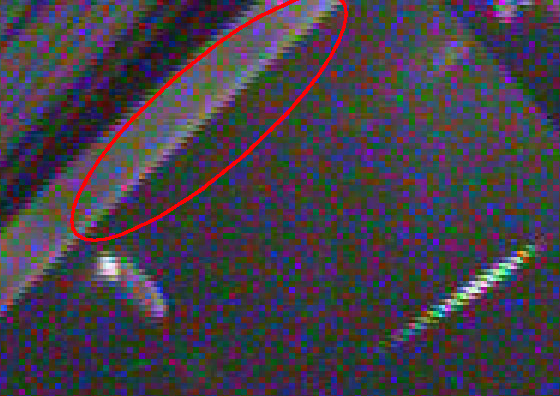 The fine horizontal lines can be seen clearly where there are bright linear features, such as the meteor. I've tried changing the resolution settings, and they do seem to affect the degree to which these lines appear. The Supercurcuits PC164 camera resolution (CCD) is stated as 537x505 total pixels and 510x492 effective pixels. I've used both these settings instead of 640x480 and it doesnt remove the lines. I'm worried that these lines will affect the ability I will have to resolve fine points of light: i.e., stars. The horizontal lines are partly a result of the interlaced nature of a video signal. The video image is formed from a series (570 in PAL) of horizontal lines which are interlaced with each other so that every 1/50 (PAL) second the camera captures 1/2 the lines. This is the same way the cathode ray television works by beaming lines horizontally across the screen. The other part of the problem is that some cameras deal with this interlaced video signal better than others! There is a reason why the watec cameras are very popular here! Below is a quote from a watec vs mintron test. The PC164 prob suffers this too. But don't worry about it, your PC164 will still be very useful tool. "he main difference between the two cameras is the way the stars are displayed. An enlargement of some typical stars shows this, see Figure 6. This image shows very ‘blocky’ stars for the Mintron (left). In the Mintron image, always two lines show about the same pixel values. This is an indication that the Mintron only works with fields, i.e. every second of the interlaced images. Assuming that only the even line numbers are sampled, the odd line numbers are interpolated or copied. In addition, the Mintron image shows dark circles around the stars. This can be a result of a sharpening algorithm or a bad electronic design, resulting in a filtering effect. This effect is weakly visible also in the Watec image (mainly on the top and the bottom of the star – note that the image was rotated by 90° to allow a better comparison between the two images) but much less pronounced. Both of these properties clearly make the Watec the better choice of camera if, for example, photometry is the aim of the video capture. If, however, planetary imaging is the goal of the user, the Watec may have the problem that the exposure time cannot be reduced. " Thank you for very interesting image. At first, I thought this is just normal "Interlace effect". But I found that all diagonal lines in the image have jags also. It is serious. I thnk there are two possibilities. One is ... the physical vibration of camera. It seems that the order of even and odd lines is reverse. This can be caused only by the video camera or the capture board. I have heard that there are some cameras that the field order is not correct. But I have never confirmed it. Capture board also has a chance to reverse the order. Anyway, It is not the mis-match of resolution. Can you see the jags on the monitor TV that connected directory to camera? If you can, the problem is in the camera. Otherwise, I think, the cause is in the video capture device or its device driver. yes wrong field order too can do this!